Those Wily Wilers: Where were They in 1900? Remember Fanny Wiler, the daughter of Caroline Dreyfuss and Moses Wiler, the one I could not find and thought might have been married to a man who killed himself and a child in a fire? Well, I still had not had any luck finding the real Fanny Wiler despite several more hours of going back over my research and looking more deeply into the sources. Although I was doing pretty well with the rest of her family up through 1880, they also proved to be elusive as they approached the 20th century. In 1880, Caroline and Moses Wiler were living in Philadelphia, and Moses had retired from his career as a merchant. Their son Simon, then 37, was still living with his parents and working as a salesman. Their daughter Eliza and her husband Leman Simon had moved to Pittsburgh where Leman was in the liquor business, and they had five children, Joseph, Flora, Nellie, Minnie, and Leon. While going back over my research, I discovered that Eliza and Leman had had one other child, Isadore, born in July, 1871, who died at 28 months on August 16, 1873. I cannot decipher the cause of death. Can anyone tell what it says? UPDATE: My expert says it says “Inflammation Brain.” Apparently doctors are trained to read each other’s awful handwriting. “Pennsylvania, Philadelphia City Death Certificates, 1803-1915,” index and images, FamilySearch (https://familysearch.org/pal:/MM9.1.1/JKQ7-78S : accessed 6 February 2015), Isadore A Simon, 16 Aug 1873; citing , Philadelphia City Archives and Historical Society of Pennsylvania, Philadelphia; FHL microfilm 2,021,999. When I last wrote about Eliza and Leman Simon, I was a bit puzzled by the seemingly impossibly close birth dates of Minnie and Leon, their youngest two children. Two census reports indicated that Minnie was born in 1877, no earlier than August 1877 and possibly as late as December 1877, and Leon’s death certificate said he was born on June 13, 1878. It just seemed very unlikely that Leon was born ten months (at most) after Minnie, but it was, of course, entirely possible. But I went back to look again and realized that while Minnie was listed with the family on the 1880 census, Leon was not. 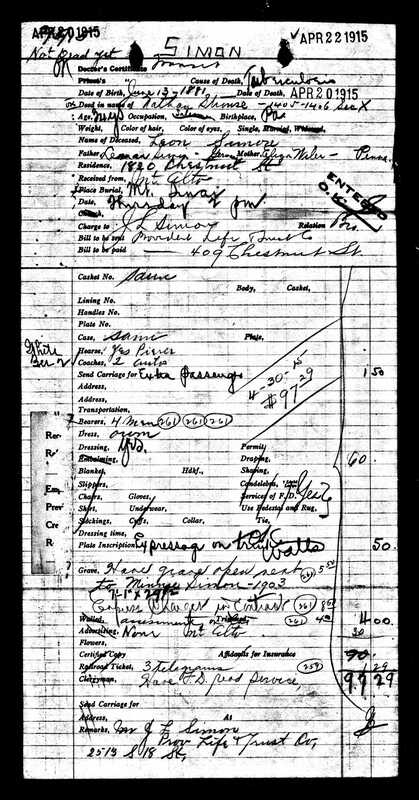 Further research uncovered this bill from his funeral, indicating that his birth date was June 13, 1881, not 1878, which makes a lot more sense. Thus, the death certificate was most likely inaccurate (and there are other questions about that document, but I will get to that later). Caroline and Moses Wiler’s youngest child, Clara, and her husband Daniel Meyers, a clothing merchant, were living in Philadelphia with their five children (as of 1880), Bertha, Leon, Samuel, Harry, and Isadore. Thus, in 1880, I could account for Caroline Dreyfuss and Moses Wiler and three of their four children (all but Fanny) and their ten grandchildren. Then things start getting a bit more difficult. Although I found burial records for Caroline indicating that she had died on December 21, 1885, and was buried at Mt. Sinai cemetery in Philadelphia, I cannot locate a death certificate for her in the Philadelphia City Death Certificates 1803-1915 database on familysearch.org. On the other hand, I was able to locate a death certificate for her husband Moses in that database; he died almost exactly two years later on December 26, 1887, and was also buried at Mt. Sinai. 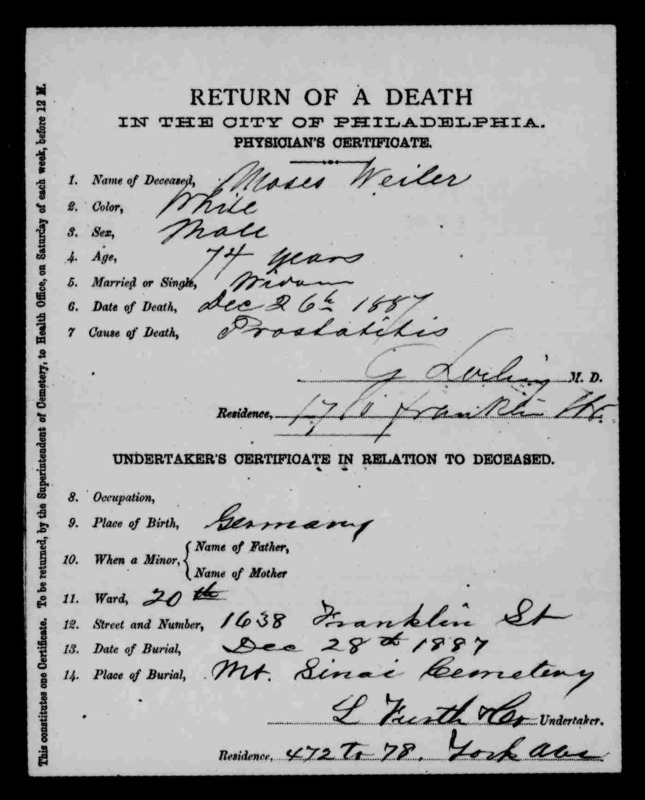 “Pennsylvania, Philadelphia City Death Certificates, 1803-1915,” index and images, FamilySearch (https://familysearch.org/pal:/MM9.1.1/J6S6-XY5 : accessed 6 February 2015), Moses Simon, 27 Jan 1897; citing cn 15654, Philadelphia City Archives and Historical Society of Pennsylvania, Philadelphia; FHL microfilm 1,869,753. Moses Wiler was residing at 1638 Franklin Street at the time of his death in 1887, and that is the same address listed for his son-in-law Leman Simon in the 1887 Philadelphia directory. I don’t know whether Moses had moved in with Leman, Eliza, and their children, or vice versa. Since Leman and Eliza had been listed in the 1884 directory for Pittsburgh, it could be that they had moved back to Philadelphia sometime around or after Caroline’s death to be with Moses. Leman’s occupation is listed as “salesman” in that 1887 Philadelphia directory without any indication of whether he was still selling liquor. 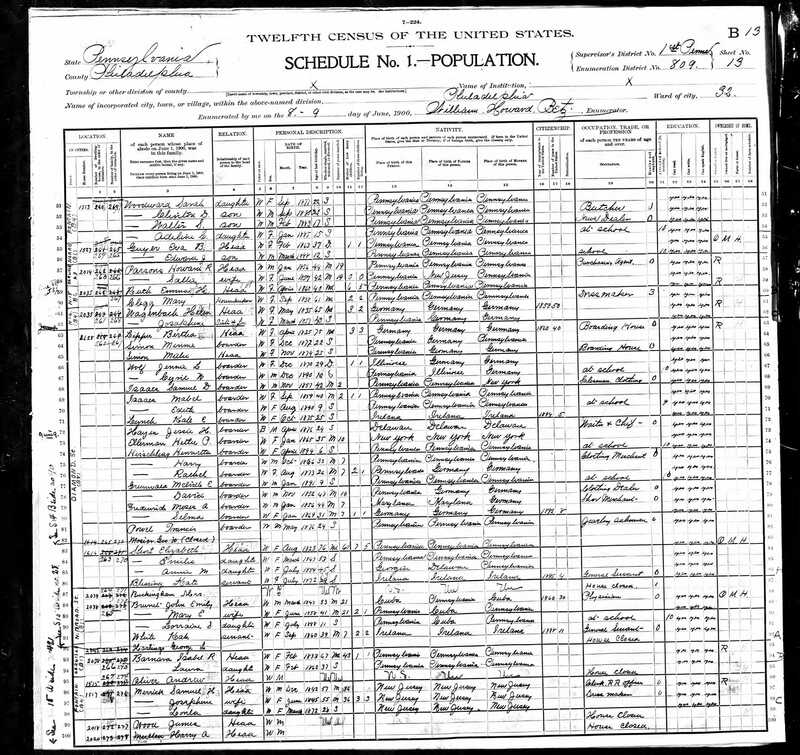 Assuming that Eliza and Leman returned to Philadelphia around 1885 or so, their children would have been still relatively young: Joseph 21, Flora 19, Nellie 11, Minnie 7, and Leon 4. Certainly the youngest three would still have been living at home. Joseph appears to have been in Pittsburgh until at least 1886, as there is a Joseph L. Simon listed there, selling cigars and tobacco products, a business line that was being practiced by other members of the family during that time, including Joseph’s great-uncle John Nusbaum. After that, however, he does not appear in the Pittsburgh directory as far as I can tell. Eliza and Leman’s daughter Flora married Nathan Strouse in Philadelphia in 1888 when she was 22 and he was 46. Their son Lester Nathan Strouse was born on December 15 of that year. In the 1890 Philadelphia directory, Nathan was listed as associated with Strouse, Loeb, and Company, clothiers. Leman and Eliza were still living at 1638 Franklin until 1890 when they are listed at 1821 Franklin Street. Joseph also is listed in the 1890 directory at that address, so he must have been living with his parents at that time along with the three younger children, Nellie, Minnie, and Leon. Joseph was working as a clerk. He may have moved out by 1892 because there are two Joseph Simons listed as salesman in the Philadelphia directory for that year, though I cannot be completely certain either is the correct Joseph Simon. In 1897, Leman and Eliza (Wiler) Simon were living at 1537 Montgomery Street. Eliza died of apoplexy on August 18, 1897. She was 55 years old. Leman continued to live at 1537 Montgomery Street through 1899, according to the Philadelphia directory of that year, which listed him once again as a salesman. 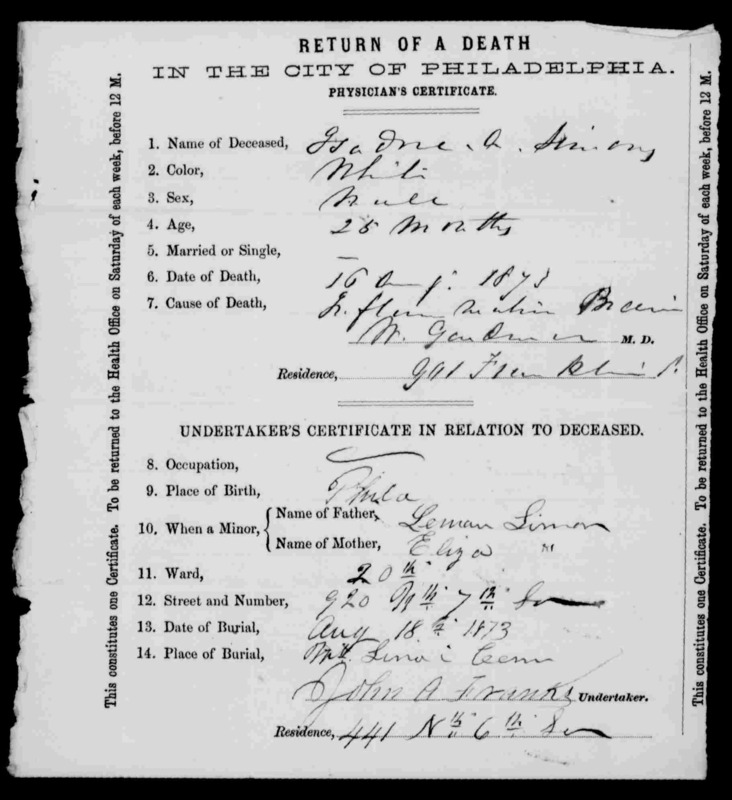 “Pennsylvania, Philadelphia City Death Certificates, 1803-1915,” index and images, FamilySearch (https://familysearch.org/pal:/MM9.3.1/TH-266-11571-16485-19?cc=1320976 : accessed 6 February 2015), 004009659 > image 190 of 1791; Philadelphia City Archives and Historical Society of Pennsylvania, Philadelphia. Now things get very sticky. I had a very hard time locating the family of Eliza and Leman Simon on the 1900 census. The only one I am certain about is Flora and her husband Nathan Strouse and son Lester Strouse. On the 1900 census, Flora, Nathan, and Lester were living at 913 North 16th Street, and Nathan was 57 years old and did not provide an occupation for the census. Living with them was a 30 year old woman named Nettie Dreifuss, born in 1870 in Illinois whose parents were born in Germany and Pennsylvania, as were Flora’s parents. She is identified as the niece of the head of the household, Nathan. I first wondered whether this was Nellie, Flora’s sister. But Nellie was born in 1874 in Pennsylvania, not 1870 in Illinois, and she was Nathan’s sister-in-law, not his niece. I then spent most of a day trying to find out whether Nathan had a sister who married a Dreifuss. He did have several sisters: Rebecca, who never married; Gussie, who married Joseph DeYoung and had one daughter Harriet; Henrietta, who married Leopold Lewis and had two daughters, Minnie and Fanny; and Rachel, who married Ed Henrinan (? ), but apparently was divorced and had no children. I thought that perhaps it was one of Henrietta and Leopold Lewis’ daughters, but neither was named Nettie, and I located both elsewhere on the 1900 census. So the “niece” did not appear to be Nathan’s niece. If Nettie Dreifus was not Nathan’s niece, was she Flora’s niece? None of Flora’s siblings was married in 1900; none of them had had children. I still don’t know who Nettie was. But her name was Dreifuss, Caroline Wiler’s birth name. Could this be a daughter of a Dreifuss/Dreyfuss brother whom I’ve yet to find? That’s a research path I will need to pursue further. But at least I knew where Flora and her family were living in 1900. Her father and her siblings proved much more elusive. I had a very hard time locating Leman Simon and his son Leon on the 1900 census, but I believe that this is Leman and Leon living together at 1514 Brown Street as Leon, Sr., and Leon, Jr.
Why do I think this is Leman? Because he is a 64 year old widow born in Germany who immigrated in 1866 and who was working as a salesman. Although my records show that Leman would have been 65 and that he immigrated in 1856, the numbers are close enough, given the general unreliability of census data. In addition, Leon, Jr. fits with my Leon roughly also: born in 1880 in Pennsylvania to parents born in Germany and working as a clerk. Again, it’s not perfect. Leon was born in 1881, and his mother Eliza was born in Pennsylvania. So I am not at all positive that this is Leman and Leon, but they are the closest matches I can find on the 1900 census. Despite using as many resources and wildcard searches as I could imagine, I cannot find Joseph at all on the 1900 census. I even had assistance from Antoinette from the Facebook Pennsylania Genealogy group, but neither of us could find him. There is a Joseph L. Simon living at 2137 North 18th Street in the 1901 Philadelphia directory, the same address that is given for Le(h)man Simon for that year, so I assume that is the right Joseph, working as a clerk with his father working as a salesman. But Joseph is not listed at that address in the 1900 census nor is Leman, so they must have moved there in 1901. As for Minnie and Nellie, I think I found them on the 1900 census, but cannot be 100% sure. I found a Minnie Simon and a “Millie” Simon living at 2628 Diamond Street on the 1900 census. Both are listed as boarders. Minnie is listed as a single woman born in 1877 in Pennsylvania with a mother born in Pennsylvania and a father born in Germany; that matches Minnie correctly. No occupation is given. I was quite certain that this was Minnie, but it took me a while to think that “Millie” was Nellie because although they are both at the same address, Minnie is listed as a boarder in the household of Bertha Lipper, and Millie is listed as the head of household in a boarding house at the exact same address with sixteen boarders. “Millie” was a single woman born in 1874 in Pennsylvania whose parents are listed as born in Germany, both mother and father. Although Nellie’s mother was born in Pennsylvania, not Germany, the age and marital status are correct, and the name is quite similar. Once again, I cannot be completely certain that this is Nellie, but I am pretty sure. I think it was really one large boarding house where the two sisters were living. I am not sure why “Millie” was also described as a head of household. Thus, if my hunches here are all correct about Leman Simon and his children, only Joseph Simon was really missing from the 1900 census. Leman was living as a boarder with his son Leon; Nellie was living as a boarder with her sister Minnie. Flora was married and living with her husband Nathan Strouse and son Lester and a mysterious niece. When I mapped out where they all were living, I realized that Flora was living just a few blocks from where Leman and Leon might have been living, but Minnie and Nellie were about two miles further north. If Joseph was already living at 2137 North 18th Street sometime during that year, he was less than a mile from Minnie and Nellie. As for the other children of Caroline Dreyfuss and Moses Wiler, Simon, Fanny, and Clara, Simon was working as a clerk in a hotel where he also resided in 1900 at 152 North 7th Street. He was single and 56 years old. Clara and her husband Daniel Meyers were now living at 920 North Franklin Street. Clara and Daniel had had five children as of 1880; between 1880 and 1896 they had had eight more children, including one stillbirth. But in 1882, they lost their first born child Bertha to heart disease. She was only nine years old. 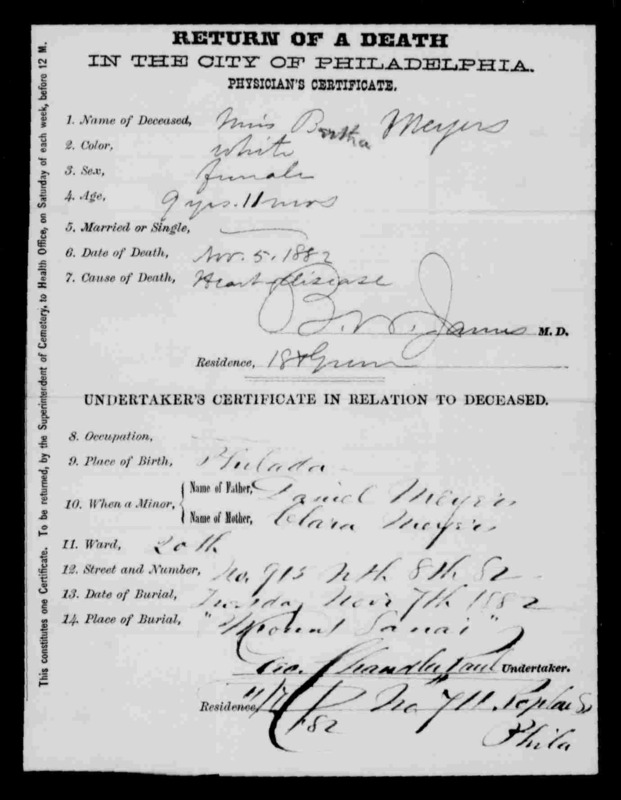 “Pennsylvania, Philadelphia City Death Certificates, 1803-1915,” index and images, FamilySearch (https://familysearch.org/pal:/MM9.3.1/TH-267-11083-70387-38?cc=1320976 : accessed 6 February 2015), 004058695 > image 726 of 994; Philadelphia City Archives and Historical Society of Pennsylvania, Philadelphia. Thus, as of 1900, Clara Wiler and Daniel Meyers had eleven surviving children, all of them still living at home. This entry was posted in Dreyfuss, Genealogy, Pennsylvania, Philadelphia and tagged Dreyfuss, Pennsylvania, Philadelphia, Pittsburgh, Wiler by Amy. Bookmark the permalink. It sounds like you have a good story on the way! I can’t wait to hear it. Have you considered looking for Caroline’s death record on the microfilm by date? Maybe her record is so misindexed you can’t find it. I think I did check by date, but you never check too many times. Thanks! How handy to have a medical handwriting expert on hand. Even after enlarging the image, I couldn’t make out the cause of Isadore’s death. My brother said that he thinks it’s easier for him to decipher the handwriting because he is more familiar with the terminology so knows what to look for. That made sense to me, although I still think that doctors have some secret handwriting that only other doctors know how to read!